Some countries have succeeded in having disputed intellectual property registered in their own names and it’s too late to undo things. There is still a big question mark as to why some are under the false impression that whatever is located within the national borders of Iran only belongs to them and no one else. Perhaps, for the very reason they think of historical and cultural heritage as their inherited property! What makes things worse is that some are not concerned about the preservation of cultural heritage because they do not even feel attached to it. People fall into two categories according to their reaction to what is left behind by the past generations. Some denounce historical items as a bunch of odds and ends which are too out-of-date to have any value; others keep visiting museums and hailing them. Sometimes we forget the fact that what we consider dilapidated historical sites which should be leveled and replaced with skyscrapers or a bunch of useless items which are simply gathering dust in museums are in fact our cultural heritage; without them we have no evidence to prove the deep roots of our civilization. In case of their disappearance, if one day we claim that we are a civilized nation, posterity will mock us and wonder how a nation can call itself civilized while failing to preserve what is passed down to it from its ancestors. Living at the heart of one of the greatest human civilization centers does not give us the right to say we can do whatever we want with the heritage. We should bear in mind that what we have access to today belongs to all humans and is not only ours. In other words, although our cultural heritage is in our possession, it’s world property. That’s why years ago UNESCO started to register national property as world property, meaning that world heritage belongs to all humans regardless of their race, color of skin, religion or nationality. Thus, preservation of such property does not fall only on the country which owns it; rather, all UNESCO members are duty-bound to safeguard it. That reflects global concerns about the preservation of world civilization. After UNESCO’s decision to register the cultural heritage of different nations, Iran made efforts to have at least a small part of its cultural heritage sites registered in a bid to both prove its historical identity and guarantee its preservation. 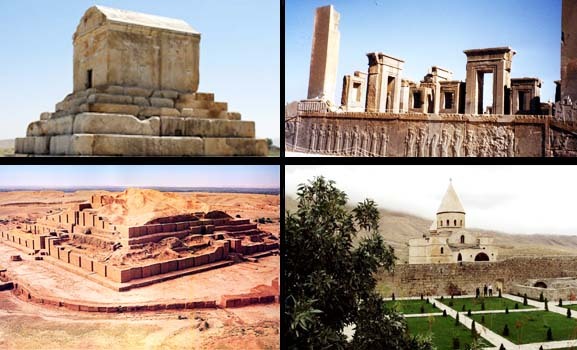 The bid resulted in the registration of 17 historical sites such as Susa’s Chogha Zanbil, Persepolis, Pasargadae and West Azerbaijan’s Saint Thaddeus Monastery. In 2006, UNESCO made another decision to register the intellectual property of countries under their own names. In this regard, Iran has so far had a small part of its intellectual property registered. Among other things, Nowruz and the skill of carpet-weaving have secured a berth on the UNESCO world list of intellectual property. Iranian heritage and too many ownership claims! As for registration of some items, there are disputes underway among countries as they each want to lay claim to their ownership. The main problem lies in the fact that Iran used to be an absolutely vast country with modern-day Azerbaijan, Armenia and Afghanistan being part of its territory. Some countries have succeeded in having the disputed intellectual property registered in their own names and it’s too late to undo things. Legally speaking, it’s possible to apply for the registration of joint ownership which would lead to the property being registered under the names of two countries, but that task is too challenging. In fact, a laundry list of Iranian property has been registered in the name of other nations. For instance the sport of polo, which dates back to the Achaemenid Empire in Iran, as well as the Ashighlar music, tar, an Iranian musical instrument, and Yalda have been all registered under the name of Azerbaijan; Turkey got Iran’s coffeehouse, Lavash, an Iranian bread, has been registered under the name of Armenia, and the UAE has laid claim to Iran’s windcatchers. Unfortunately, claims to ownership are not confined to things and include historical figures like Rumi, Ferdowsi, Omar Khayyam, Al-Farabi, Nizami Ganjavi, Avicenna, Nasreddin, Nasir al-Din al-Tusi, Abu’l-Fadl Bayhaqi, Al-Biruni and Pourya-ye Vali. What beats me is that no one disputes the claims of some Arab officials. How could Nasir al-Din al-Tusi have hailed from an Arab country while his family name, al-Tusi, clearly indicates his hometown, Tus [an ancient city in the northeastern Iranian province of Khorasan Razavi]?